A Trip to Connecticut! Part Two. Magic Times Two is Here! Dangerously Charming in TWO MONTHS! If you read yesterday's post, you already know that I snuck out for a mini-vacation to Connecticut over the weekend to visit my friends Terry and Glenn. We crammed so much goodness into two days, it didn't fit into one blog post! The sea lion show was amazing. Then we went into Mystic proper (I'd never been there) and we had an amazing lunch at the Treehouse restaurant outside on the top of The Oyster Club. Yes, those are oysters topped with cream and bacon :-) And onion rings. Hey--I was on vacation! These were one of the best things I ever ate in my life! If you're in Mystic, don't miss this place. Then we wandered around town and found all kinds of cool things in all kinds of cool shops. Between Mystic, the beach, and the museum shop from the day before, I came home with all kinds of swag. But some of it was for the cat sitters, I swear! Mystic Dragon Tea! How could I not get it? It was hard to leave on Monday morning, and Terry and I have already exchanged half a dozen emails saying how much we miss each other. But this was waiting for me at home, and that made it a little easier. Magic, keeping the bed warm. All in all, it was a fabulous 3-day mini-vacation, and I feel so much better for having taken it. But don't worry...I'm back to work on the Llewellyn 365 Day book and getting ready to dive into all sorts of promo and giveaways for the upcoming release of DANGEROUSLY CHARMING. But man, it was a great trip, and we made memories that will last for a long time. Some of you might have seen me post something on Facebook or Twitter last Thursday about "sekrit plans" for the weekend. 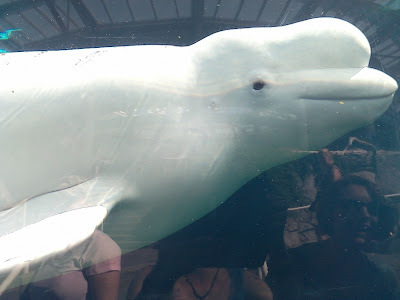 Now that I'm back, I'll share with you where I was and what I did. 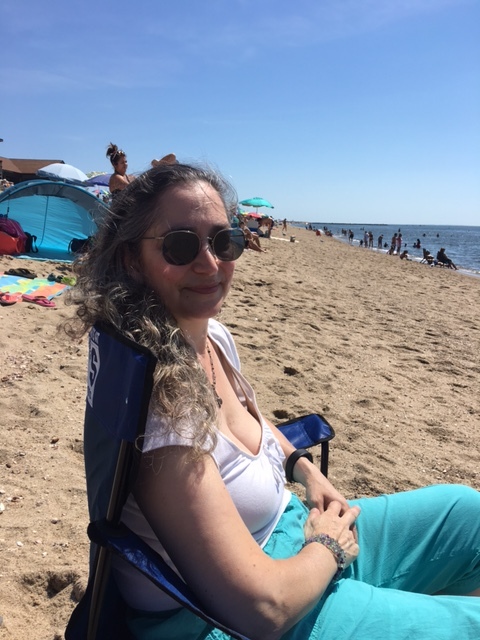 I went to Connecticut, in fact, to visit my friend Terry and her husband Glenn. They used to live here in Oneonta, but moved to Connecticut about 18 years ago. They have been great about coming to visit me here at least once a year (either Terry on her own or both of them together), but it took me until now to get my act together to go visit them. And man, did we have a great time. As you know (Bob), almost all of my traveling is writing/work related--Pagan and writing conferences, that sort of thing. This trip was a mini-vacation. Nothing but fun. (And maybe some research for future books.) I didn't realize how much I needed a break until I finally took one! I took the bus to Albany Friday morning, and Terry drove out and picked me up there (about 2 hours from her house). 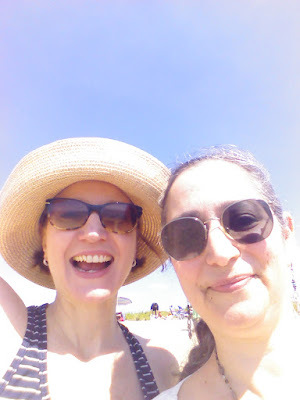 We spent the evening hanging out and catching up, and then on Saturday, Terry and I headed to the ocean near Essex. We only got to hang out there for about an hour, because Terry is English/Irish and even with sunscreen, will burst into flame if she is in the sun any longer than that. (Yes, I think she is a vampire too. Shhh...) Still, an hour at the beach makes me VERY happy. This is Terry. Say hi to Terry, everyone. 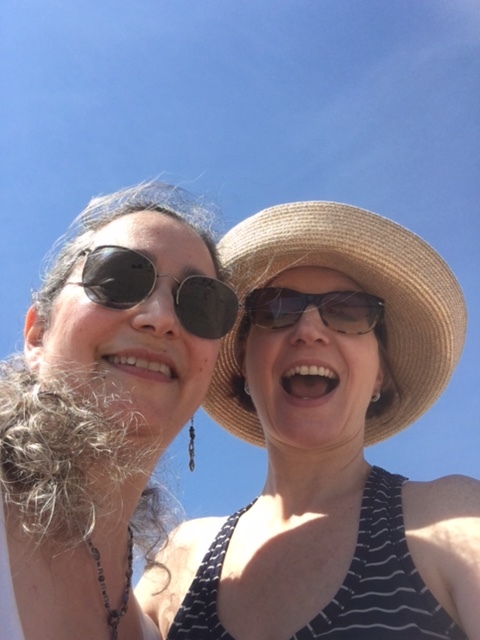 Then we drove to Old Lyme to meet up with Glenn at the Florence Griswold Museum, where we had an amazing lunch at their cafe, and then spent a blissful couple of hours walking around looking at American Impressionist paintings and the cool old house and gardens. This is Glenn. Say hi to Glenn, everyone. The view from our table outside...a lovely river. Yes, that IS a lobster BLT. The museum was small and charming. I highly recommend a visit, if you are ever in the area. We decided this was a picture of us. Me on the left in the black, of course. This is Pippa. Say hi to Pippa, everyone. And that was just Saturday! Wait until you see what we did on Sunday. Hopefully, I'll get that up tomorrow, since it was too much to fit into one blog! Tell me, do you ever take a mini-vacation or a long weekend away? If so, where do you go? When I got there today, I called for Luna and she came running right away. We did her "jump up on the stool and sit for treats" trick, and then just hung out. It is still tough to have to walk away, but seeing her so content reminds me of why I gave her up to a new home in the first place. Don't bother me with that camera, I'm killing this toy! It still seems strange to only have three cats after having five for so long. I just redid the instructions for the cat sitters, and taking Minerva and Luna's names off the list made me kind of blue... On the other hand, it will be a much easier job for them, and that's something! One of my favorite things about summer is playing in the garden and reaping the benefits later (yes, pun intended). This year, because of the bum knee, the garden has been less like fun and more of a challenge, but thanks to some helpful friends, I do have some lovely veggies and fruits (and a lot more weeds than usual, but we're just ignoring them, right?). The finished plate, plus an ear of corn not from my garden. And a beer, of course. Do you like to grow fresh veggies? Or at least eat them? What is your summertime favorite? Note: 2 1/2 hours out in the garden made my knee very cranky. Sitting down to write now. As many of you know, my friend Mindy Klasky and I have been working on a new project--a Duo of paranormal romance books that includes her FRIGHT COURT and my WITCH EVER WAY YOU CAN. Two complete books for the price of one! (Only $2.99!) What could be better? A giveaway or five, of course. No idea how the TV thing works or if it does...but TABLET! It should also be available other places like the Nook today or soon. I hope you'll join us for this day of fun and celebrate my long-awaited re-release of my very first novel. And if you haven't met Mindy yet, be sure to say a big Deborah Blake friend hello! And don't forget to spread the word far and wide. Okay--she wasn't actually lost. We knew right where she was. But it wasn't here. My friend Kathy, who inspired the fire tower watcher in Wickedly Powerful (and did an amazing job of answering questions about how the whole thing worked, so Sam was as realistic as I could make him) lived here 8-9 years ago. She was a beloved member of Blue Moon Circle, and we all pined when she left to return to Arizona to help out her daughters and grandchildren (and spend some summers up in the fire tower in Wyoming). The last trip she took out here was five years ago, which was WAY too long a time. She helped out in the garden, since she missed having one, and my knee still doesn't kneel. Chris and Kathy chatting on the back deck in the evening. I have no idea what was wrong with my face in this picture! Maybe I was thinking about her leaving again, since this was her last day. I hope she doesn't wait another five years for her next visit. The guest bedroom awaits you, Kathy! 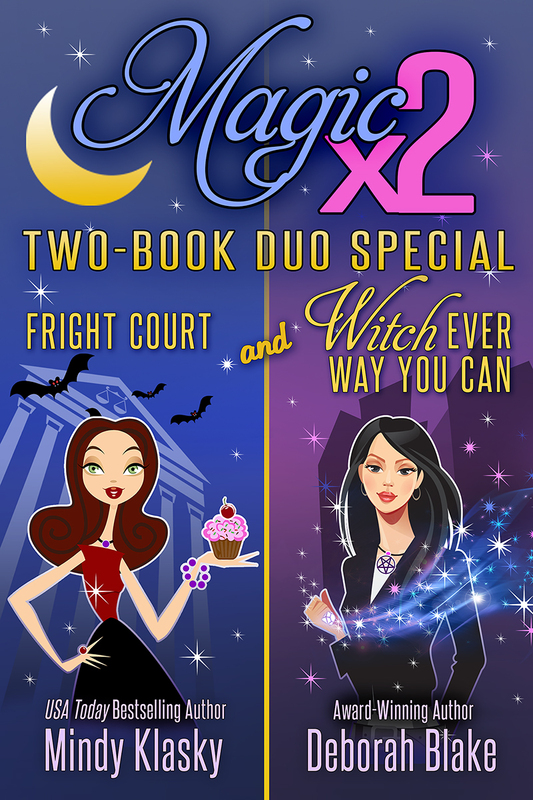 Magic x2 is a two-book duo special featuring my first novel, WITCH EVER WAY YOU CAN and Mindy's fun light paranormal FRIGHT COURT. Yes, that's right--two complete novels for the price of one, because that's just the way we roll! To celebrate, we're going to have a HUGE giveaway next week, but in the meanwhile, I'm giving away this prize pack of a notebook, a postcard, and a witch's broom pen. As always, no purchase is necessary, and all you have to do is use the Rafflecopter form below. Yes, you can get credit for things you've already done (like follow the blog) if you click on those options. Magic clearly loves this giveaway! You know how it seems like it is forever before the book you are waiting for comes out and then you turn around and it is almost time? Guess what? DANGEROUSLY CHARMING will be out in TWO MONTHS!!!!! Is it October 4th yet? Not quite? Well then, here's something to help tide you over. I'm giving away a cool tote bag and a notebook (plus some bookmarks and such) to one of you lucky blog-peeps. Enter at will! Tell me, are you excited about the Rider books? Or would you have rather had another Baba Yaga novel? Are you signed up to receive my newsletter? Because if you're not, I think you're going to want to be. Yes, that's an Amazon Fire Tablet. And yes, I'm giving one away to one lucky person, but only through the newsletter, which is coming out August 4th. (TWO MONTHS to the day before Dangerously Charming is released!) So you might want to fill out the form at the top left of this blog and sign up.